Horde Weekend Open Thread at anibundel’s place! Should be open at 4:00 pm, EST, and if I know my ani, it will be open at 4:00 pm, EST on the dot: http://anibundel.wordpress.com/ Have a lovely, long weekend, y’all! Not getting peanuts thrown at you — white privilege, part the many. I’m sorry, I just can’t get over how utterly and entirely fucked up the following is. An African American camerawoman for CNN who suddenly found herself assailed by peanuts at the Republican National Convention Tuesday reacted as many would. “What are you doing? Are you out of your damned mind?” she said, according to a friend. “Here’s some more peanuts,” responded one of two “older-than-middle-aged white men,” the friend, Jamila Bey, told Journal-isms by telephone on Wednesday. “This is what we feed animals,” they said. And all of that is fucked up. Like, whoa. It’s not like I didn’t know that racism — real racism, of the kind that limits and delimits and takes lives — is still very much among us in these United States, and that it cares not for your achievements or position. I knew that. But the fact that I am shocked and horrified that this woman wasn’t at all surprised to be treated like filth in a public setting, right there in front of God and everybody, is a little insight into just how little I really know. John Lennon, Rick Perry and words that are not ours. White Americans really need to shut up and listen. Pop quiz: What religio-political leader said the following, about which nation? Do good, God, wipe them out, kill them…. Destroy them God, obliterate them from the face of the earth. 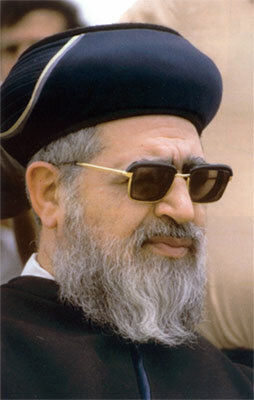 If you said Rabbi Ovadia Yosef, head of Israel’s Shas Party and one of the country’s ultra-Orthodox kingmakers, and further guessed that he was talking about Iran—please take a seat at the head of the class…. …Yosef also mentioned Hezbollah (“when we say that our enemies, foes and anyone who desires to do evil to us should be cut off, we should have in mind Hezbollah and Iran”), but even having said that, I’m finding it hard to see a real difference between these statements, and statements so like them that emanate from Iran. In both cases, men who consider themselves, and are considered by legions of followers, to be exemplars of their faith communities, leaders with direct insight into the heights and depths of their religions’ teachings and traditions, are calling on the Almighty to do what they genuinely believe the Almighty already wants to do: Destroy the other guy. When such things are said in Persian, Jews around the world rightly react with some alarm. To read the rest, please click here to go to Open Zion/The Daily Beast — but don’t click too hard! You want to read it, not obliterate it. Why do black folks vote for Democrats? Ok, so yeah. The African American community votes pretty solidly for Democratic candidates — this we know. The Washington Post decided to poll folks, asking why they think this might be so. So, yeah. 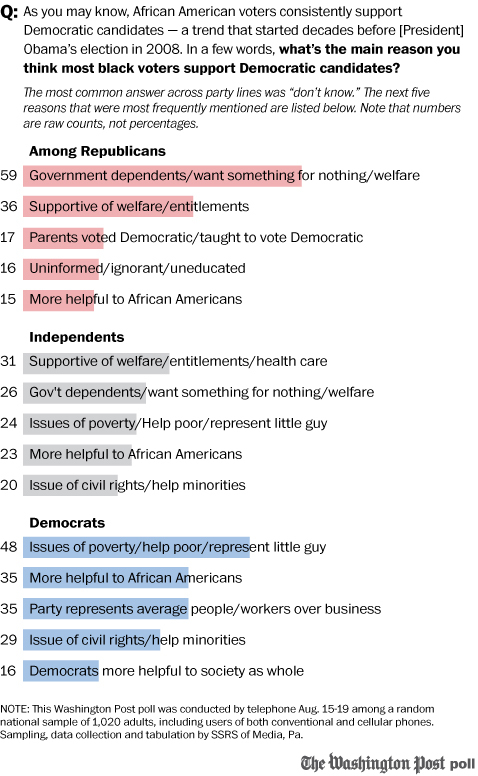 Even taking all the caveats into consideration, I still think the results are pretty striking: The vast majority of Republicans polled who think they know why blacks vote for the other party think it’s because African-Americans either: take/want government hand-outs; have been socialized into being Democrats; or are just plain ignorant. 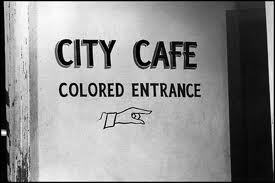 It’s a wonder the GOP hasn’t won over more people of color. An absolute mystery. Apparently three would be TOO MUCH – an open thread. Two days in a row, there were OTANs at the mothership. Real OTANs!! The kind that are AN and everything! Alas, today you’re stuck with me. On right-wing extremists and reducing all of Judaism to one thing. I think you can’t really tell just from reading the below at this point, but I was nearly pulsing with rage while writing this, my latest at Open Zion/The Daily Beast. I had to keep hitting delete, and it’s a wonder the backspace button didn’t just fly off at some point. Anyway, here’s the top – the rest of the rage can be found by clicking here. 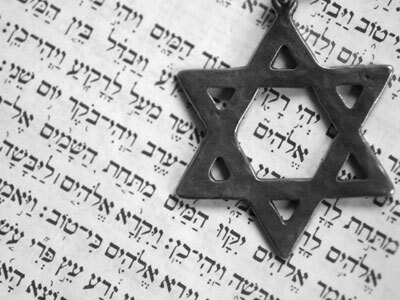 Last week, Kristol and Dunetz smeared a group of American rabbis who have the temerity to serve on the Rabbinical Council of Jewish Voice for Peace…. What’s that you say? 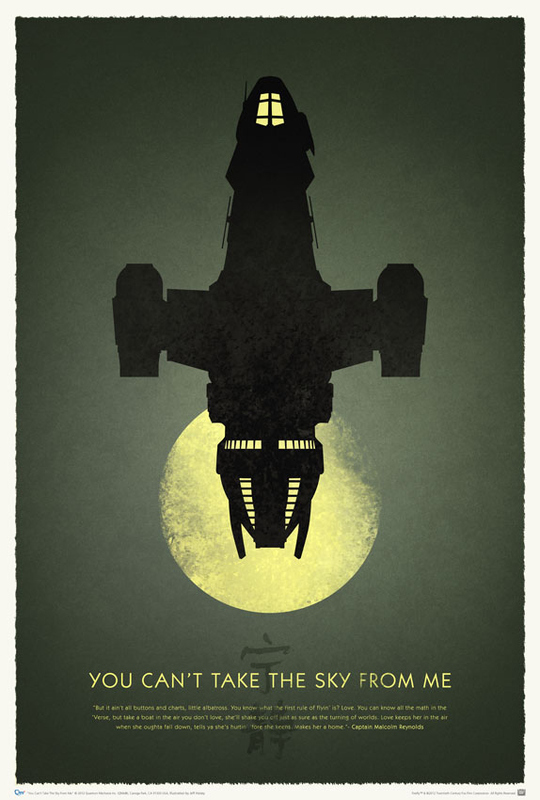 Firefly’s 10th anniversary is coming up? The problem being that the former costs one hundred American dollars (I’m sorry: ninety-nine American dollars and ninety-nine American cents) and the latter, while a little pricey but not prohibitively so at $19.95, comes with a $9.60 shipping charge. And that just ain’t right. 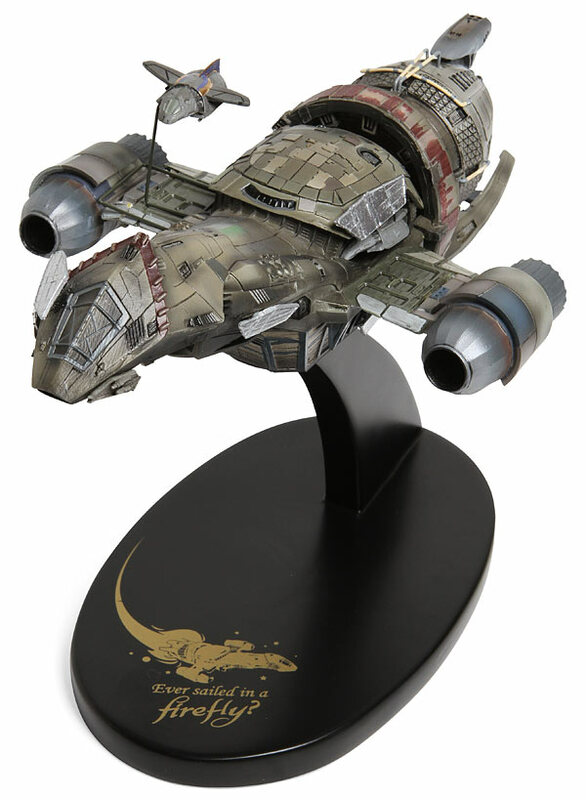 (For the record: I’m pretty sure that the $100 to-scale Serenity model is worth every penny. It’s just a lot of pennies). 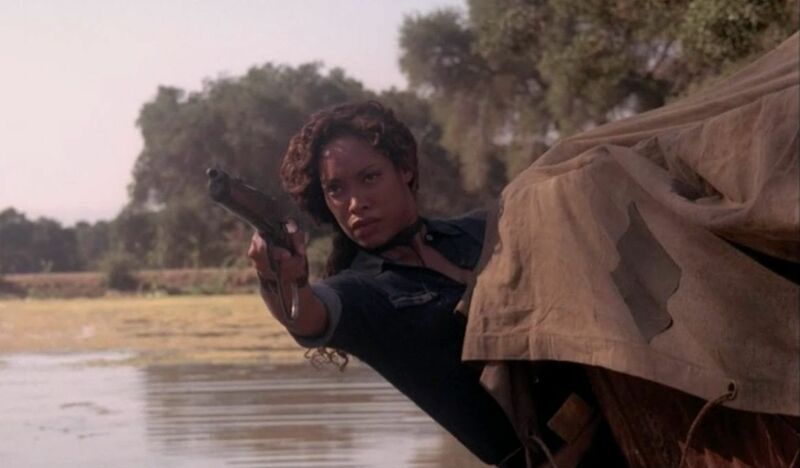 I will say this though: Whether or not I decide to abuse my poor, post-bar mitzvah bank account for some sweet Firefly swag, I have a date marked (quite literally) on my calendar: November 11, the date of SyFy’s Firefly reunion special (“Browncoats Unite,” or some such) and day-long series marathon. Do I own the series on DVD? Sure do. Could I stage a day-long series marathon all on my own if I wanted to? Sure could. But will it be better knowing that I’m watching with all the other Browncoats and awaiting the crown jewel that will be the special? Hell yeah! That will not only be shiny – it will be the shiniest. (No, I’m sorry. “The shiniest” would be: New episodes. “The second shiniest” would be: A second movie. Doing what I just described will be the third shiniest. Just so’s we’re clear). Maybe I could dress like Zoe for the event! I’m not sure I could carry off the look, though. I’m nice, but I’m no big damn hero. Posted in Geekery, Good Stuff, Squee! OMG arglebarglelkgfiu…ok, crying nao: Super Dad is super. 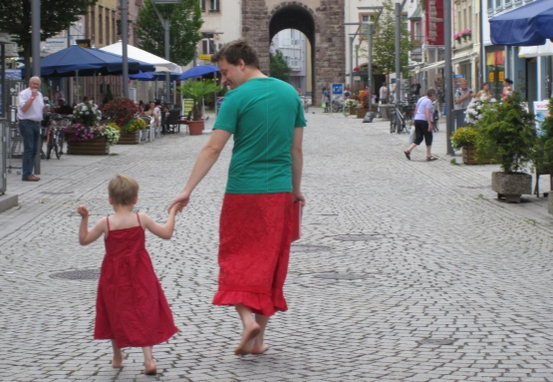 Nils Pickert’s five-year-old son likes to wear dresses. To this very day I’m thankful for that women, that stared at us on the street until she ran face first into a street light. My son was roaring with laugher. And the next day he fished out a dress from the depth of his wardrobe. At first only for the weekend. Later also for nursery-school. And what’s the little guy doing by now? He’s painting his fingernails. He thinks it looks pretty on my nails, too. He’s simply smiling, when other boys (and it’s nearly always boys) want to make fun of him and says: “You only don’t dare to wear skirts and dresses because your dads don’t dare to either.” That’s how broad his own shoulders have become by now. And all thanks to daddy in a skirt. Posted in Children, Good Stuff, Love, Social Justice, Squee! Dear World, Re: the start of the school year. 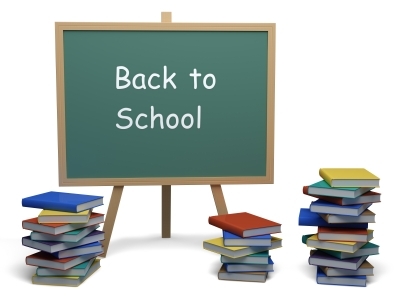 Just, FYI: Not every parent loves it when their kids go back to school. Every single year (indeed, after just the two weeks of winter break, or even the week of spring vacation), I miss my kids when they go back. I know this is what we do, and it’s ok, and we get into a rhythm and I would never even consider home-schooling because that wouldn’t work for us on any level — but, just, you know. I hate that people act like I should be giddy to have them out of the house. I miss ’em, I truly do. PS On a not entirely unrelated note: Spend enough time looking at the word “school” and it just starts to look weird, mirite?